Greenwillow Grains grows and mills their own organic grains right here in the Willamette Valley. They offer both compostable and cloth packaging that includes "farm of origin" labeling. All of their bread flour is stone ground on American-made mills in Brownsville, Oregon. Their product line is comprised of several organic goods, including Hard Red Wheat, Rolled Oats, Gluten-Free Oats, Pastry Flour, Bread Flour, Rye Flour, Flax Seed, Flax Oil, and more. 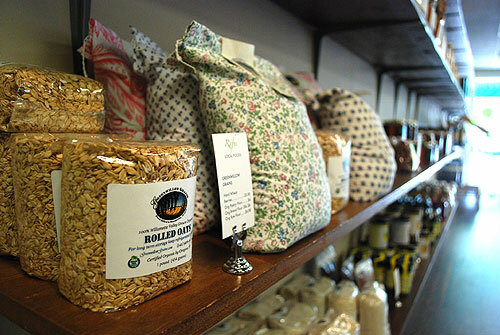 At Rafns' we carry Rolled and Gluten-Free Oats, Bread Flour, Wheat Berries, Pastry Flour, and Rye Flour. We also have the ability to special order any of their grain and bean products with a bit of advanced notice. For more information, visit www.greenwillowgrains.com.